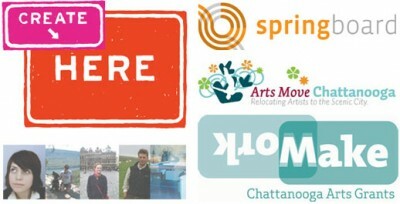 If you’re looking for an effective precedent in how to jumpstart the creative economy in your city, you need to learn about CreateHere in Chattanooga, Tennessee. On July 1, 2007 Helen Johnson and Josh McManus entrepreneurially initiated a three-month research and planning project focused on studying the engagement of creatives in the city with the intention of gaining a better understanding of how to retain and attract them, crucial to its transition to a post-industrial knowledge economy. Helen and Josh experienced such a tremendous amount of enthusiasm among 24-35 year olds that wanted to interact with and help define their city that they established a collective of programs now identified with CreateHere, with a goal of achieving a robust, self-sufficient creative economy and sustained community engagement by emerging leadership. ArtsMove – These are essentially $15,000 grants for artists buying homes in five designated natural cultural districts, provided as five-year forgivable mortgages. SpringBoard – An 8-week planning class to assist new or struggling entrepreneurs to produce an effective business plan. CreateHere is currently looking to establish a business acceleration program modeled after PeerSpectives, Opportunity Knocks and CEO roundtables. MakeWork – A $150,000 arts grant program for artists and artisans within a 50-mile radius of the city. The criteria prioritizes those projects that will stimulate cultural and economic growth. LeadHere – Think Teach for America for emerging creative community leaders. It’s a paid fellowship program, 20 to 40 hours a week, designed to empower the next generation of leaders to further grow the creative economy. The two keys to CreateHere’s success? Identifying what peoples’ passions are, then putting the right people together to make a program happen. Which of these programs do you think is most effective in growing a creative economy?